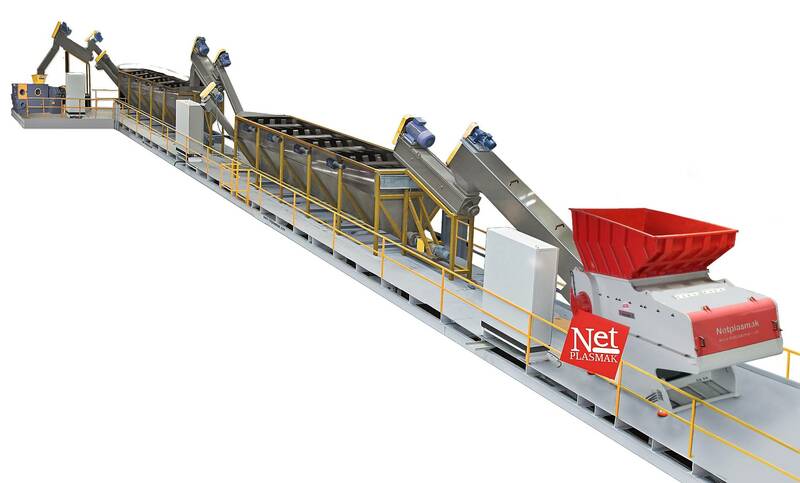 Plastic Recycling Lines contain washing basins, crushing machine, agglomerator, drying unit, granule extruder and packaging unit. Waste plastic recycling is recovery process of waste plastics and producing reusable raw material. Recycling of plastic starts by sorting waste material according to their resin types such as polyethylene, polypropylene, polystyrene, PET, PVC etc. Clean plastic waste can be melted and converted into pellets (granules) by using granule extruders. Before extruding, a size reduction or densifying process might be necessary. This can be done by using crushing machines or agglomeration machines. Contaminated plastic material has to be washed and dried first. For example plastic shopping bags which has been recovered from city waste has to be washed thoroughly before granulated. These shopping bags are made with high density polyethylene (HDPE) or low density polyethylene (LDPE). Agricultural films such as greenhouse covers (LDPE) also can be recycled. The environmental benefits of recycling plastic are that it produces less waste and less carbon dioxide. Plastics are being used more and more nowadays. Disposing used plastics by land filling is a serious threat to environment. So recycling is only solution. Recycled plastics can be used for producing trash bags, flower pots, park benches, industrial Pallets and pipes etc. When you are inquiring recycling machinery, please include plastic type, material state (film, lumber, crate, pipe etc. ), contamination level (whether you require washing machines or not) and hourly capacity requirements. We look forward to answer your every kind of questions and inquiries regarding to plastic recycling.